The Sibyl tells the story of two people: first, the story of a man who is cursed by Jesus for preventing him from resting against his house while carrying the cross to Golgotha, commonly known as the Wandering Jew; and second, the main arc of the novel, the story of the former oracle of Delphi, now living a disgraced and outcast life in the hills outside of the city. My reading of this book then and now isn’t about good or bad. Reading this story is about taking part in something larger than yourself, something not completely understandable, something just meant to be experienced, incomprehensible, greater-than, awesome – in its truest meaning. Awesome is not just the easy descriptor given to everything from that burger you had for lunch to the new Star Wars movie. Awesome means to inspire awe. It is means, if I may reference the OED, immediate and active fear, dread or terror. Perhaps this is not the first way most Christians want to think of God, but throughout this past Christmas season, as I read the story of Christ’s birth to my children and attended church services from different denominations, fear was brought up a lot, though rarely honed in on. Do not be afraid. I mean beyond the startling experience of seeing an angel, commonly depicted as a glowing, floating figure that only Fox Mulder could believe in, why would meeting an angel be frightening? But three times we read do not be afraid. And this is a creature only next to God. Not God, but a servant of God. If an angel can inspire fear, how much more so could an encounter with God? 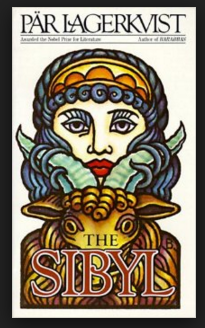 Which brings me back to The Sibyl. The man has come to ask the sibyl what his future holds now that he has been condemned to wander for eternity and to find no rest. Her response is her own life story: her childhood; her experience with god as the temple’s pythia; her great love of a neighbour, his death, and her pregnancy and resulting violent expulsion from the city. As they discuss their stories, the sibyl keeps coming back to the idea that an encounter with god is not simple experience. He is not as we are and we can never understand him. He is incomprehensible, inscrutable. He is god. And so far as I comprehend it he is both evil and good, both light and darkness, both meaningless and full of a meaning which we can never perceive, yet never cease to puzzle over. A riddle which is intended not to be solved but to exist. To exist for us always. To trouble us always. Her life, tied so closely to the experience of god, was lived in opposites. Life in the temple lifted her up but held her separate. She experienced ecstasy and terror by god’s hand. As a result, she does not deny that she hates god for the destruction in her life but also says she owes god her every happiness. The space created in this story to both doubt and believe, to feel anger and peace, to be part of and separate from God continues to fascinate me. The awe of encountering something incomprehensible, to be touched by God, bound up in him, has a certain pleasure that is irrationally appealing, as the pythia’s story reveals. In the end, the man leaves her side believing the answer he is seeking may only be found in his endless wandering. The answer cannot be spoken but only lived. I read and reread books like The Sybil to find more clues to the riddle that is God, to find the edges of my own understanding and belief. I accept that I will not find an answer to my questions or doubts, not for myself or for any others who come and question faith and the existence of God, but in reading and questioning and discussing, I live and search in hope of a truly awesome encounter with the incomprehensible I AM.